The below table shows the minimum and recommended system requirements for running the v3 Module. All modules prior to v3.12.x will not work with the Core Addon v1.5.x or above! Fixed Sidebar styling issue with admin template "V4"
Get your Reseller ID. From where can I get my Resellerclub ID? Get your Reseller API Key. From where can I get my API Key? Whitelist your Hosting Server IP's where you have WHMCS installed. Where I have to whitelist my Hosting Server IP? 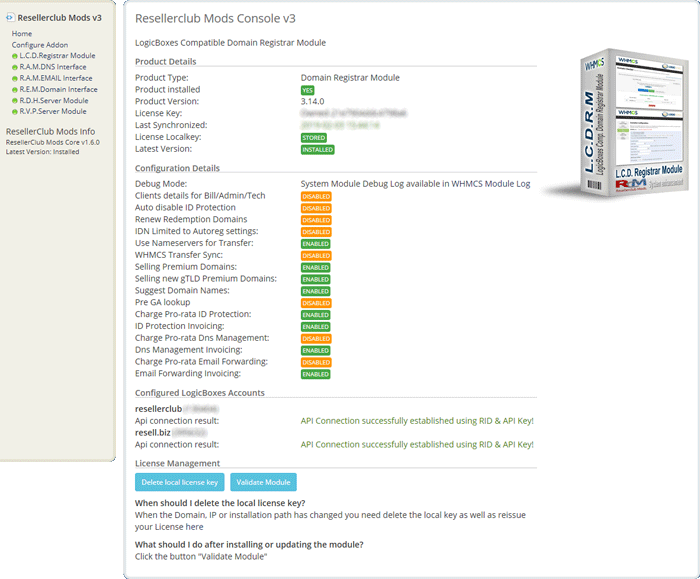 Once whitelisted your Server IP's, log into our client area and download the Resellerclub Mods Management Core Console Addon v3, available from any of the product license details page TAB "Downloads". Unzip the file with your prefered decompresion software. Upload the folder "modules" from the unzipped local folder \resellerclubmods_core_x.x.x into the whmcsroot/ folder. The "whmcsroot" folder is where you have installed your WHMCS. Click the Button "Activate" and then "Configure"
API Key: Set your API Key. You can find your API Key in your LogicBoxes Reseller Account » Settings » API. Reseller Password: Set your Reseller Password (Deprecated). You can leave this field empty. Domain Registrar: If you have setup another LogicBoxes Registrar module instead of one of the four built-in Modules, for example "Resellerid", then you can setup the account by selecting the registrar from the dropdown menu. License Key: Set the license key for the Product or Products you ordered previously. You can find the License Key for each Product in our Client Area Products details page. Nameservers for Transfers: By default, the LCD Registrar module does not pass nameservers for domain transfers. You can force to use always the specified Nameservers (default or custom) for Domain Transfers by activating this option. Ignore Domain Transfersync: Tick to ignore the built-in WHMCS Transfer sync. Disabling is recommended if you use a third party advanced transfer sync tool. Disable Re-sent Email Buttons: By default, customers can re-send the RAA / IRTP Verification Email and GDPR Autorization Email. Tick to disable the re-sent buttons and show only the pending status messages. New gTLD Premium Domains: Tick to enable selling new gTLD Premium Domains. If not enabled, available domains considered as "premium domains" will be shown as unavailable. Selling Premium Domains: By default, the module does not offer these feature. If you would like to sell premium domains, then you need to activate this feature first. Premium Domain Results: Specify the number of results to show. If empty, the default value of 5 will be used. Premium/Suggest Domain lookup: Select the registrar to use for premium and suggest domain lookup. This should be one of the registrar's you use for register domains! DNS Check Global : R.A.M.Dns Interface comes with a Name server check and auto change function. It checks if the domain name has been configured with the correct Reseller DNS Servers and offers the possibility to change automatically to the partially or fully branded Reseller Name servers. You can globally disable the check and change function by activating the Checkbox. DNS Check Hosting : This options acts like the "DNS Check Global" but only if the domain has a non LogicBoxes Hosting account. If activated, the function to check and change DNS Servers will not be offered if the domain uses a non LogicBoxes Hosting Account. Google Apps DNS Records: By default, the DNS interface shows 1-click Google Apps DNS Record setup for A, CNAME, MX, SRV and TXT(spf) records. If you do not want to expose these buttons, then tick the checkbox. DNSSEC Support: By default, the DNSSEC Interface is available to manage these records for any TLD configured in the below field. You can disable the interface to your customers. TLD's with DNSSEC Support : Up to date, DNSSEC Support is only offered for com, net, org, in and me Domains. You can configure and extend the default list for any other TLDs with DNSSEC Support. Domain Forwarding Check: The Build-In Domain forwarding Interface in R.A.M.Dns Interface always checks if a domain has an active hosting plan and disallows the Domain forwarding Service to be activated. You can disable the Hosting Service Check for the Domain forwarding Activation Process by checking the Checkbox. Hosting Account Check: By default, FREE Email Service will not be accessible if a domain has a hosting account associated in your WHMCS. This is useful to avoid MX Record conflicts between the Hosting account and the FREE Email service. However, you can disable the check function and allow FREE Email Service. FREE Email Accounts. By default, FREE Email Service allows Email accounts setup. With every domain, 2 Email accounts can be created by the customer. You can globally disable this feature to allow only Email forwarder Service. Whois ID Protection: R.E.M.Domain Interface allows the customers to activate/deactivate the WHOIS ID protection instantly from the Client Area Domain Contact details page. If you do not want to offer your customers the possibility to activate/deactivate the WHOIS ID protection, then uncheck the checkbox. Domain API Url: The LogicBoxes Domain API URL: https://domaincheck.httpapi.com. Do not change this unless instructed! Access Control: Select The Administrator Roles who should have access to the addon from the admin area. Finally, click the button "Save Changes". Goto Setup » Staff Management » Administrator Roles and select the Admin Group who should have permission to see the widget on the admin home page. 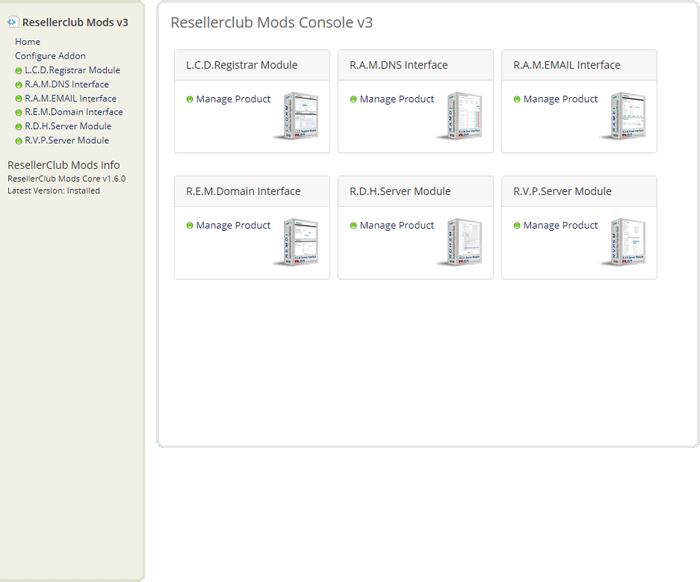 Under the "Widgets" Section you will see the new widget called "Resellerclub Mods Management Core Console ". Tick the checkbox and "Save Changes"
Do not upload files individually into locations not indicated by these instructions. The update has been finished.